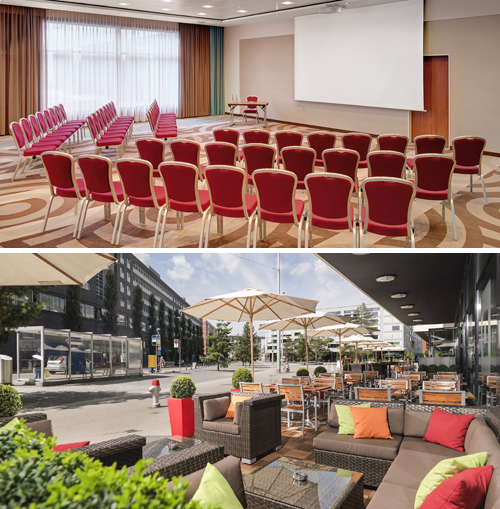 The Hotel Courtyard by Marriott Zürich Nord is centrally located between downtown Zürich and Zurich Airport. Zurich city centre is only 7 minutes away and Zurich Airport 10 minutes. Numerous companies, the Hallenstadion and the Zurich Exhibition Centre are within walking distance. Whether you travel to Zurich for business or leisure purposes, the Courtyard by Marriott Zurich North offers the ideal hotel accommodation with spacious, comfortably furnished hotel rooms and suites, fitness area, business centre and free Essential Internet throughout the hotel. Enjoy regional and international dishes in the bistro -eat.drink.connect. With its large sun terrace or make use of the varied selection of snacks and drinks in the Grab n‘ Go Market, which is open around the clock. 590 m² of conference space with a large foyer, seven flexible meeting rooms with daylight and state-of-the-art event technology as well as sufficient underground parking offer the best conditions for successful meetings, seminars and events in Zurich. Collect Marriott Rewards points or Miles & More points for every hotel night or event at the international chain hotel Courtyard by Marriott Zürich North and benefit from upgrades, free overnight stays and great premiums.